Complete your daily CTM regime with the complete range of Lakmè Absolute products! The Lakmè Absolute Pore Fix Toner is designed specially to tighten pores, remove impurities for a smoother and hydrated skin. Enriched with Witch Hazel and Lavender Extracts, this alcohol-free toner, also moisturizes the skin. It comes with an easy application spray nozzle that evenly sprays and distributes the toner on your skin to remove impurities and hydrate the skin. 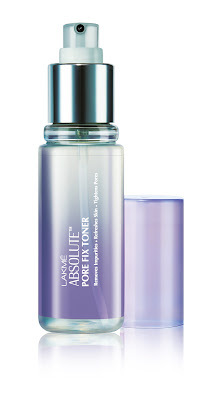 Cleanse: Wash your face with the Lakmè Absolute Skin Gloss Facial Foam to relieve the skin of any dust or grime. Cleansing removes all the impurities and readies it to absorb all the goodness of the toner and moisturizer. Tone: After washing your face, spray it with Lakmè Absolute Pore Fix Toner to tighten the pores and remove deep-seated impurities. The alcohol-free toner ensures your skin gets hydrated and stays smooth. Moisturize: Follow this up with the Lakmè Absolute Skin Gloss Reflection Serum and Lakmè Absolute Skin Gloss Gel Crème for achieving completely hydrated and dewy skin. The Lakmè Absolute CTM regime is specially designed to quench your skin’s thirst, making it glossy and smooth. Follow this simple regime every day and you will find yourself and waking up to beautiful, glossy and dewy-looking skin! Contemporary Indian beauty expert Lakmé continuously innovates to offer a wide range of high performance and world class color cosmetics, skincare products and beauty salons. In addition to leveraging Unilever’s worldwide expertise, Lakmé also partners with leading cosmetic house, Milan-based Intercos Italia, Schwann Stabilo Germany and Paris-based Fiabila. Combining international cosmetic technology with an in-depth understanding of the Indian woman’s needs, Lakmé also offers its consumers a comprehensive beauty experience through its products and services at the Lakmé Salons and Studios.